Self-Completing Dots and Dashes at a 3:1 ratio. 6-60 WPM Speed Adjust, Lighter Weighting at Faster Speeds to Help Mitigate Rig Tx Lag. "Mode A", "Mode B" and Basic Iambic Sending Methods. Build these extras to make your homebrew keyer even more awesome! Adjustable Digital Element Weighting (Mark:Space = 1:9, 1:4, 3:7, 2:3, 1:1) with 5-70 WPM Speed Adjust. "Ultimatic" & "OZ" Mode (MSK5) Squeeze Keying Method Input Adapter. Input [Dot/Dash] Bypass Switches - Keyer can operate like a "Bug" or "Cootie". Keying Interface - Will Key Most Rigs: (Up to 1000v / 2 amps) Grid Block Keying (-V), Cathode Keyed Tube Transmitters (+V) and Modern Rigs, plus electrical and RF isolation. 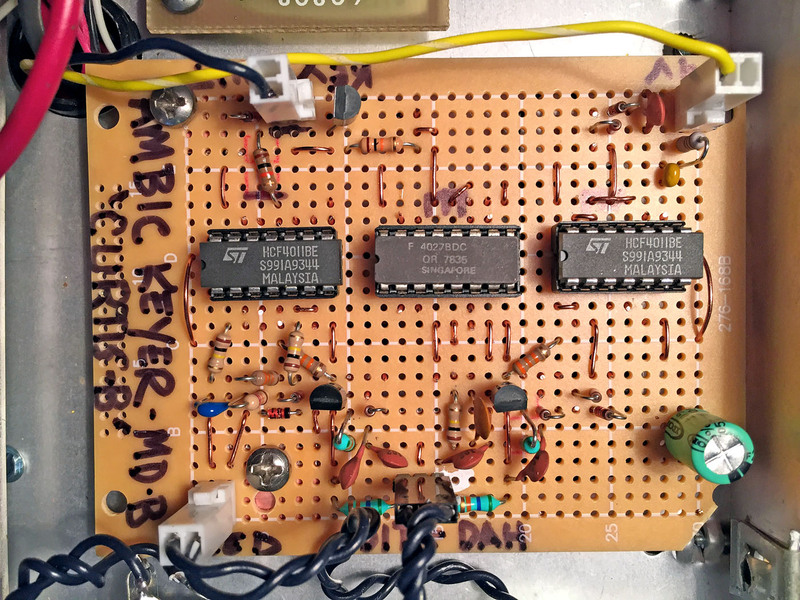 It’s true that commercially available keyers come as simple kits or encoded on tiny chips for only a just few bucks, but to get one of those you still have to order online or travel to a ham fest, and once you set up your brand-X keyer, there’s often some tricky menu navigation or programming involved. What if keying was all you needed - why not just build your own using easy to obtain parts? I know many hams, since electronic keying became a reality in the late 1940’s, have come up with cleaver schemes for automatically producing clean and evenly spaced Morse code, each employing various implementations from tubes to microcomputers, so could this ham have equal success? I scoured the internet looking for an easy circuit to build and even tried designing variations of my own on paper - with only minor success - which would have used 555 timers and 4017 decade counters. I thought of using an Arduino� or maybe programming some kind of stand-alone chip. I knew what I wanted my circuit to do: it needed to make evenly and properly-spaced "dits" and "dahs" that could be sent in an "iambic" pattern (toggling them back and forth) if both paddles were squeezed. It needed to obviously control my rig's key input too. So what type of circuit should a builder like myself consider? When I was a kid, integrated circuits (ICs) containing standard "discrete" logic building-blocks were the rage. Logic, you know, is the language of computers – “1’s” and “0’s.” My dad's generation embraced transistors as the modern marvel that freed us from hot and power-hungry vacuum tubes, but the basic electronics we learned up through the 1980’s were based on these primary components and practical arrangements. Kids these days, and I mean kids, are using fancier computer-like devices such as Arduinos, Raspberry Pi's and "shields" in their classrooms. They are bypassing basic electronics training and focusing more on programming and automation skills. It's not really a bad change, it's just different. So what device should a builder consider? Discrete logic and transistor components? A Microcontroller which would be a simple IC chip or development board I could just plug power up to? I've seen a ham online "make an iambic keyer in five minutes" using an Arduino which is a credit card sized "Microcomputer." Is there such thing as overkill, or perhaps would using discrete components be too complex? To answer this, Ben Heckendorn of Element14’s The Ben Heck Show has a YouTube special on "Which Brain is Best for Your Project.” just go to: https://www.youtube.com/watch?v=znUUhnLPGAk to check it out! In fact, check out his other great videos! I saw schemes (and schematics) online that were quite complex indeed. Some used demultiplexers and shift registers and others used a sea of logic, so let’s just say I was not encouraged. Then I found it - a "Simple Keyer" design that was too easy-looking to be true. Oh Hoekstra, PA2OHH, from the Netherlands has posted his version at: http://www.qsl.net/pa2ohh/iambic.htm His is one of a few variations I've found of an original circuit crafted by Richard P. Halverson, W0ZHN and Ronald A. Stordahl, K0UXQ for the April 1968 QST Magazine (ARRL) article entitled: "An Integrated-Circuit Electronic Keyer" - later, updated by Urs Hadorn, HB9ABO, on page 70 of Ham Radio Magazine back in January 1979. Urs, HB9ABO, noted the keyer's lack of "Weighting" and Dot/Dash memory and Oh, PA2OHH, has made a few improvements, so I started with his schematic. The baton of progress never ceases to be passed in ham radio, and any circuit seems to be free game for other hams to improve upon. Unabashed, I decided to "procure" the W0ZHN/K0UXQ/HB9ABO/PA2OHH design for myself. Immediately, I ran into problems, so I added a few of my own tweaks to improve stability and performance. Building and improving the circuit on my prototype breadboard took a good week, but eventually it all came together. I chose to go with this circuit for my keyer which uses discrete and basic logic components – parts invented in the late 60’s and early 70’s. It's not an easy circuit to follow at first, especially if you're not familiar with the in's and out's of flip flops and gates but is very clever and ingenious in its simplicity. 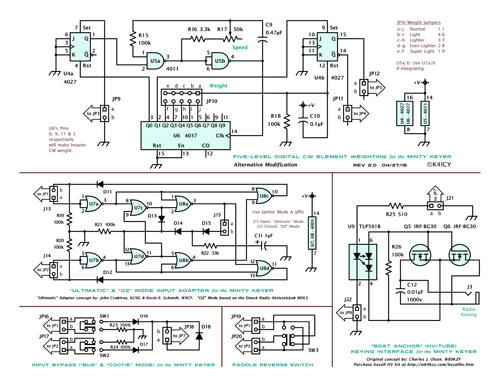 Circuit Description: Let’s take a look at the schematic. [PROVIDED BELOW in JPG and PDF] This is the largest circuit I've ever presented in my TARS Newsletter Weekend Radio article and takes a little experience on the builder's part, so I would consider this at least an "intermediate" level in project complexity. Also, the circuit is actually easier than it looks as there is a lot of wire routing and headers of future modding. It's okay not to have this figured out right away - it took me a few days to understand Oh's original circuit, but its "beauty through simplicity" becomes evident with some careful logic-path study. Parts all together should be inexpensive ($15) since the ICs are around $1.50 each. The literal heart of this keyer is the Logic Oscillator which uses a NAND Gate Astable Multivibrator– to learn more please visit: http://www.electronics-tutorials.ws/sequential/seq_3.html U1a; is a NAND logic gate - more specifically, this is one of four "4011" CMOS NAND gates. The "4000" series integrated circuits are more forgiving as far as voltage and current use goes, accepting anywhere from +5 to +15 volts, more or less depending on the type. The inputs are high-impedance which brings current consumption down to nil giving this project a long battery life! This NAND (U1a) gate acts as a traffic cop. When the input pin 2 receives a "high" signal (a binary "1",) which is a more positive voltage and is close or exactly in value to the power source value, and also if U1a also receives a high signal on pin 1, pin 3, the output will yield a "low" signal (a binary "0") which has no or very low voltage in respect to the power source. As this is a NAND gate, if either of the inputs are low then the output will always be high – please reference the Truth Table. D1 through D10 are just "steering" diodes, meaning that current can only pass one way. In this configuration they only will allow high signals to pass through their routes, and essentially makes a multi-input OR gate. You'll notice that U1a's pin 2 is connected to ground via R8, a 100k. What this does is allow pin 2 to "see" a more low signal if there's no positive voltage coming through any of the steering diodes. So in effect, pin 2 is always low until one of the three or so routes presents a “high” signal. C5 bypasses any unwanted AC, or actually, any abrupt changes to U1a's pin 2 due to "bouncing" from the paddle contacts. It also helps prevent any of your rig's RF from influencing the oscillator. U1b is a NAND gate that has had its inputs tied together, therefore, any high on the inputs will output a low and vice versa, which makes this an inverter or "not" gate. Its common practice to use leftover gates on an IC in this configuration as a freebie inverters where needed. U1a's pin 1, U1b's pin 4 and the junction made up of pins 3, 5 and 6 are linked together via a resistor/capacitor (RC) timing network in a type of digital Colpitts oscillator configuration. Since pin 4 is in at an opposite state from pin 3, when one side has a voltage potential (source,) the other has more of a ground potential (sink.) [Voltage potential, for charge and discharge will be routed through R10 and each respective part of R11 and R12 and a routing diode; D8 (SEE PWM SCHEME BELOW)] charging C6 at an expected rate, and when C6 is more fully charged and taking in less voltage, pin 1 of U1a will, at its threshold, "sees" a high at pin 1. Given that pin 2 is high, pin 3 will go high, pin 4 of U1b will go low and C6 will then discharge through R9. The input at pin 1, through R9 at 100k, presents a much higher impedance than the resistor network; R10+R11 (or R12) so the discharging of C6 will maintain a high signal for a certain length of time. Because of the high-to-low or low-to-high threshold difference, called "hysteresis" the resulting signal on pin 3 of U1a and pin 4 (opposite state of pin 4) of U1b is a nearly perfect square wave. In this circuit, adjusting R10 should produce code elements in the range of 6 to 60 wpm, perfect for most hams. I know I over-complicated things in my description but basically, it's just a clock that makes pulses only when told to. Let’s step back a bit. To tell U1a to allow for oscillation, otherwise it will stand still in waiting, we have to get a positive voltage signal through D1 and/or D2 – the paddle inputs. With either a dual-paddle or single-paddle key connected to J1, Q1 and/or Q2, any standard PNP transistor (your garden variety 2N3906,) will go into full saturation, shunting positive current through the emitter/base junction and through R3 (or R5) 56k resistors to ground via your key's contacts. Since it’s standard practice to wire keys with the common tied to ground, to get a high signal for our circuit to represent when a paddle is making contact, the PNP switch circuits essentially invert the key's ground potential. R2 and R4 allow the transistors to be completely "shut off" when not in use, and C3/C4 help "debounce" the key contacts as they may often make multiple mini-contacts as eventual closure is made at the microscopic level. Bouncing would introduce extra signals to the logic. The capacitors also help shunt away RF introduced by the rig. Since Q1 and Q2 only produce positive potentials at their collectors, R6 and R7 provide a "low" for the logic to see when the transistors are not active. So how do we get the "Dah's" and "iambic" action that keyers make? Now we introduce another common piece of discrete logic called Flip Flops. See this YouTube video for more detail: https://www.youtube.com/watch?v=bN02shtPWuI More specifically, we’re using each of two "J/K" RS Flip Flops contained in the 4027 package and they have a specific functionality. This Flip Flop has two outputs; "Q" and "Not-Q" (A "Not" is often shown a line above a letter signifying an inversion.) Q is the output and Not-Q is always at an opposite state of Q. There are also master "Set" and "Reset" control inputs that can override the condition of the Flip Flop, but here, they are always tied to ground (or kept low.) Here's how it works; the "J" and "K" inputs (initials named after the inventor: Jack Kilby, the Texas Instruments engineer that invented the integrated circuit in 1958) determine what the Q and subsequently Not-Q outputs are ONLY once a "Positive Edge-Trigger" has been signaled at the Clock input (“CLK” at U3b pin 13) In other words, the Flip Flop will only change state at Q when the input at CLK transitions from low to high. Nothing will happen when it goes from high to low. This can be a very useful feature in logic circuity. 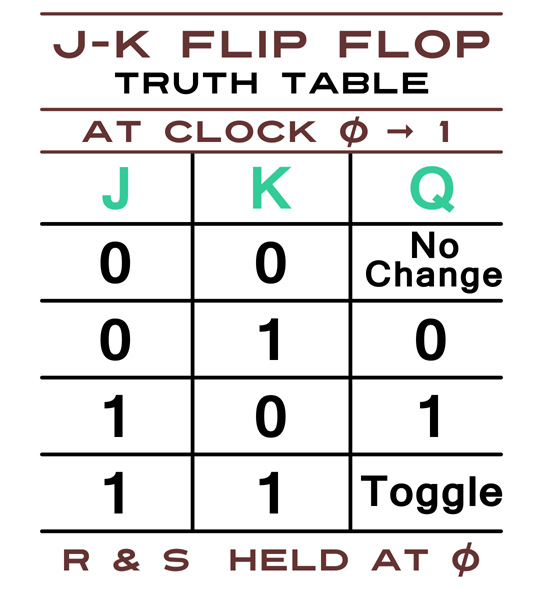 Take a look at the Truth Table: When J is low and K is also low, then on a positive edge-trigger of the clock, nothing will happen to the current state of Q - it will just stay put with no change. The following looks straight forward if you think about it: If J is high and K is low, then at a clock signal Q will be high... obviously matching the input "J" to its left on the schematic diagram. When J is high and K is low, then Q is low (Not-Q) being the same as K. Seems redundant at first glance, but it does mean at least J and K, if made high and low respectively, or in the reverse arrangement, then the output at Q can be made high or low to reflect the choice. Finally, we call into play, the special feature of the Flip Flop, and that is, if we apply a high signal to BOTH J and K, whenever a positive-edge clock signal is applied, Q and Not-Q will swap states - or toggle! Let's take a look at U3b. The flip flop's job is to do the Iambic thing, or essentially to tell the circuit wheather it is going to make dits or dahs. Pins 10 and 11 are tied to the paddle inputs and work independently representing any condition when one of the paddles on your key makes contact. We can use this information to tell the Not-Q or U3b, pin 14, to change states based on whether just the "dit" paddle is in contact (low) or the "dah" paddle is in contact (high.) The flip flop is at the same time, told to change to the appropriate state because of a new clock signal sent from pin 11 of U1d which is itself initiated by the key signals to the oscillator. With both paddles contacting, causing the J and K inputs to go high, a constant clock signal will cause the flip flop U3b to switch Not-Q back and forth between high and low... Ah ha - iambic "squeeze" keying action! "Iambic" you say? We've got "dits" from the output of U1d so what about the "dahs?" Now let's visit U3a, the other flip flop contained in the 4027 package. Its job is to help make the "dahs." First it receives a clock signal (at U3a pin 3) from the oscillator that is always inverted from the signal at U1d pin 12. Its "J" input is always kept at high, and the "K" input samples the Not-Q of U3b which means that Not-Q on U3a will either always sit at high when the "Dah" paddle is NOT pressed (U3b Not-Q is low) or will toggle whatever Not-Q's state is, as the clock signals trigger the flip flop. What do we do with U3a's Not-Q signal (pin 2?) The NAND gate U1c polls both U3b's Not-Q (pin 14) and U3a's Not-Q (pin 2) and sends a result control signal to the NAND U1d's pin 13. If only the "dit" paddle is active, then U3b's Not-Q is low which means that U1c NAND will stay at a high output on its pin 10 because one of its input are low. Consequently that means U1d will either have a "high, high" or "low, high" allowing it to match the oscillator clock with "dits" for an output. With U3b's Not-Q staying low U3a's Not-Q output will always remain at a high state, meaning that U1c NAND would never have that "high, high" input required to change its output to low. So there we have "dits" explained. Notice the grounded capacitor at U3a's pin 3: because flip flops can be very sensitive to voltage fluctuations and stray RF, U3a can act erratically if the voltage to its clock is too low or not stable. C7 and 8 allows for some stabilization and elimination of RF at the clocks of U3a and U3b. [PLEASE NOTE - Caps on the 4027 Clocks: A couple of builders have had mixed results when using the 4027 Flip Flops; some reported erratic behavior which was a mystery to them. One builder clued me in that the inputs (particularly the Clock input, pins 3 & 13) varied in immunity or sensitivity to RF, voltage fluctuations between builds and manufacturers, and capacitive/inductive coupling between lead wire that are too long may also be a cause. I discovered this myself and deemed one of my 4027's to be bad. I was told to use a bypass capacitor between each of these pins, individually, to ground. This worked fine on my build, but not on the versions of two builders that contacted me with this issue. By the time it was noted the second time I figured it would be best to omit the caps in the circuit diagram. I decided to build the circuit on a prototyping bread board with an intentionally expansive component layout using longer wire to see if RF or couple with give me issues. I was first met with random dots and dashes being produced when the dah contact was made - this was without the caps. I tried different 4027's, one being pulled from a gas station pump back in the 1980's, but the issue was consistent. I added 0.01 μF caps back into the circuit and everything was mostly fine but I was getting extra dits after the last dah. I changed the caps to 0.001 μF and the circuit was now working as designed! If you're not able to get properly formed elements, or just 'dits' the issue is with the clock inputs!. So, say the Not-Q of U3b is now at high because the "dah" paddle is contacted (and the "dit" paddle is not.) Then the inputs of U1c are now "high, high." Shouldn't that cause a low signal to be sent to pin 13 of U1d? Well, on the same clock instance, U3a Flip Flop has highs at both J and K and its Not-Q will toggle; sending a low. The states on the inputs of U1c are now reversed, but that really doesn't mean much on the first clock pulse. The Morse "Dah" by standard is three times the length of a "dit." If we look at this one from a “logic” perspective, a "Dah" would be sent sequentially as "1110." To contrast, two "Dits" in succession would be "1010." Ah. So if the second mark was kept high and all four steps were allowed to be produced, we would have a perfect Morse "Dah" element at the output of the keyer. Consequently, U3a has become a "divide by 2" logic component when the "Dah" signal (U3b Not-Q) is active, so for every two clock signals of the oscillator applied to U3a, a single clock signal is outputted at Not-Q at half the speed. Once applied through U1c to U1d, taking into consideration the timing of the oscillator we are now mixing the "1010" of the oscillator clock with the "1100" of the Flip Flop to produce a "1110." 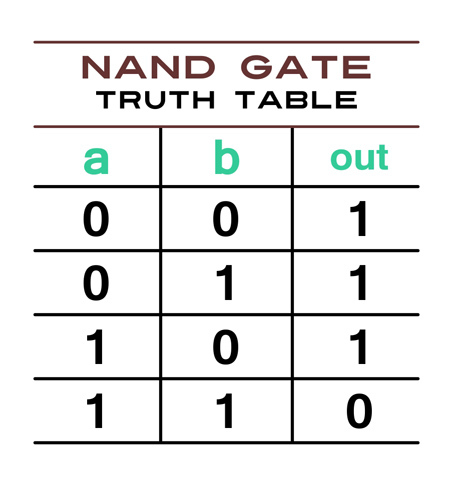 If you take a look at the Truth Table for the NAND gate you may now recognize a pattern: “0,0 – 1 / 0,1 – 1 / 1,0 – 1 / and 1,1 = 0”. Now regardless of whether or not the "dah" paddle line was tapped or held down, the keyer will continue to produce clock pulses until the "dah" element is completed. This does this by simply routing the high signal of the output of U1d (pin 11) back to U1a via D7. So there's our "Dah!" I know this is all sounds really complicated but after some close study of the schematic, you too might appreciate its simplicity. We can make "dits" now and we can make "dahs" too, so how do we alternate them to form an "iambic" sequence? With both the "dit" and "dah" contacts active, the J and K inputs of U3b Flip Flop (pin 10 and 11) are now in Toggle mode. Not-Q at pin 14 will only change states on a positive edge trigger of U1d's output. So if U3b's Not-Q represents when a "dah" is to be produced, switching it off and on with each clock trigger will form "dits" then "dahs" and on and on... iambic action! By the way, since the clock trigger at U3b pin 13 is essentially the output of the keyer, the iambic toggling will only occur AFTER a whole element has completed its sequence and the next one is just beginning. So we just discussed the core circuit created by HB9ABO. Let's talk about the K4ICY contribution: You can build the above circuit just fine without the U2 AND gate and associated diodes, D9 and 10. It will work just fine, but you will be enjoying code sending operation in "basic iambic mode" without inter-character dot/dash memory and subsequently, the Mode B addition of the extra and opposite element that the majority of hams have been trained to use.. Each time you contact a paddle the particular element called for will be produced, but if you want the next element to fall into place, say a “dit” immediately following a “dah” to make a "dahdit," if your "dit" paddle is contacted to soon before the "dah" is completed by the keyer, you may miss the “dit.” Most hams find it essentially impossible to send in this mode as too many incomplete characters or missing elements are implemented unless the operator has a perfect 'fist', which is why dot/dash memory is pretty much a requirement. MODE A or B? Basic? If you read the article "All About Squeeze-Keying" by Karl Fischer, DJ5IL, you'll learn that many modern rigs and keyer chips such as the PicoKeyer incorrectly reproduce the faithful operation of the Curtis and Accu-Keyer iambic logic (of the early 1970's) and really, each version is really no better or more special than the other. It's just that a majority of the hams out there who learned how to do "squeeze" keying and spent years on the air with it are rather fixed to the mode they were paired with. JP6 is just a basic 6-pin header, the kind that those little plastic jumpers get fixed to inside of your PC. They are pretty inexpensive and can be made from smaller 2-pin headers or by cutting down a larger one. You can also substitute a 3-position switch or simply hard-wire your desired mode and omit JP6. With a jumper connecting points a and b you will lock the Minty Keyer into iambic Mode B. NAND's U2a and U2c will not care to see if any paddles have made contact. Tying pins c or e to pin d will get you iambic Mode A. In this configuration, a high signal from either or both inputs (via diodes acting as an OR gate) will cause the U2a and U2c ANDs to allow signals from U2b and/or U2d to follow through. With this you'll get dot/dash memory just as you do in Mode B but once both of the paddles have been released, U2a and U2c will not allow the memory condition to continue and you will get no extra elements after your current one. If JP6 pins d and e are bridged U2a and U2c will not be allowed to pass information and the Minty Keyer will only key in "basic" mode with no memory and trailing opposing elements. Though convenient to pigeon hole any of these modes as default on a modern rig, this can get tricky. Most modern keyers, whether on chip or featured on a rig, say they use "Curtis A" + dot/dash memory as default. In the simplified Mode A ("basic mode") elements are only created when queued but when a memory is introduced the keyer simply polls the opposite paddle of the one the keyer is in the middle of producing an element for basically to see if something is being asked for while it’s busy. [It should be noted again that different products and circuits use various schemes.] It then inserts the opposite element after the current one is done - or just a basic memory latch. I was really not happy with the simple iambic keying the 2-IC version of this circuit produced so I added an extra AND gates and a few steering diodes. I simply poll the outputs of the U3b flip flop and the incoming paddle contacts. With the U2b AND, if pin 5 sees a high on the Q of U3b Flip Flop and pin 6 sees that the "Dah" paddle is active, then it goes low at the U2b pin 4 output which is gated by depending on JP6 and U2a. This means that if the flip flop is commanding "dits" and a "dah" is asked for, then pin 3 of U2a is high. This high signal is sent to the oscillator clock to keep it going until its associated counter element is completed. The high signal also keeps a high on the "dah" line of the flip flop so that the circuit essentially latches and all you have to do is quickly tap the "dah" paddle to ask for a "dah" to be made after the keyer is finished making a "dit." This is essentially a “bit” of memory. U2c and U2d together do the same thing except for opposite conditions. With the addition of this feature, this "simple" keyer is now on par with the basic function of commercial keyers! 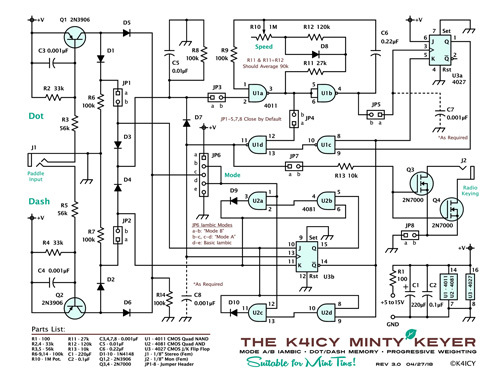 There is no claim made that the Minty Keyer faithfully emulates "true" Modes A & B operation as these older circuits use microprocessors which can deal with if's and what's down to proportions of the dit and dah's timing and even which side of the space an action takes place. 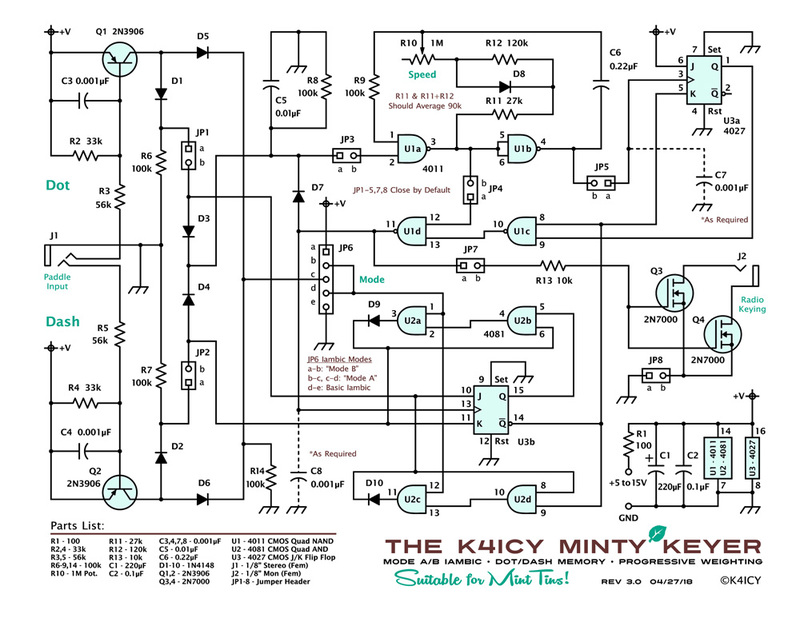 The Minty keyer does and really great job for using generic discrete logic parts. Finally, notice the configuration of the two 2N7000 MOSFETS on the keyer’s output; they both have their Gates attached to the output line and the rig’s key line connects to the Drain of each MOSFET. A high from the output (pin 11) of U1d (through current resistor R13) will cause the MOSFETS to pass current from their Drain pins to their Source pins at ground potential. How can a DC signal pass in both directions through a MOSFET, doesn’t it act as a rectifier? Well, often not shown in the schematic is a bypass diode built in which shunts backwards flowing current from the Source pin to the Drain pin. This helps protect the MOSFET from transient reverse currents that would quickly destroy it. We use this feature here to allow a path for the rig's key circuit to complete. There are a few added advantages from using MOSFETS in this configuration over Bi-polar Junction (standard) transistors or relays. Since the Gates of the MOSFETS are more voltage driven, the current needed to pass current through the Drain to Source is extremely minimal. There is better RF immunity here as there is a nearly direct path through the MOSFETS. These MOSFETS are cheap and common to source, you can find them used in many QRP kits and they can handle up to 60 volts, but it is generally accepted that half that at 30 volts should be the max. And finally, polarity is not an issue as it would be with a transistor, so if your radio keys some kind of AC waveform to activate its transmitter circuit then this should be able to pass it through. All that's remaining in this circuit are a few little components to deal with the power source. 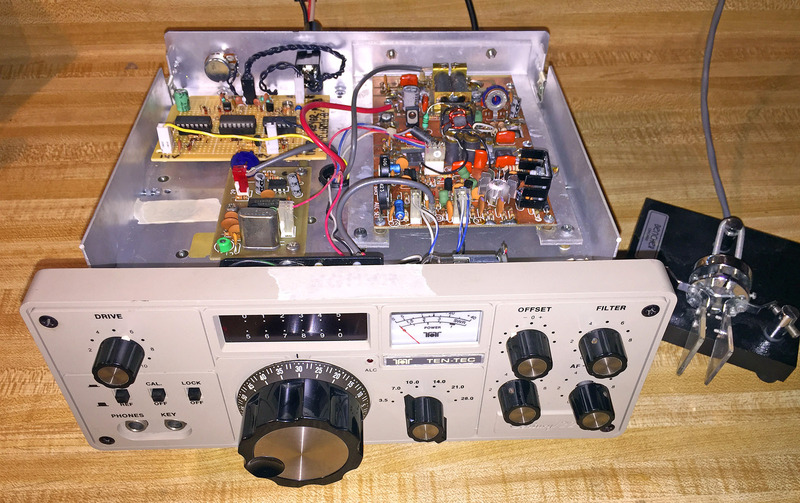 Since the CMOS logic components can typically handle anything from +5 to +15 volts, and sometimes more or less depending on the type, you can derive a power source from a USB port, a nine-volt battery or even your 13.8 volt ham shack power supply. R1, a 100 ohm resistor, helps to mitigate any voltage spikes that may be present on the line and is standard practice for IC circuits. You should also consider adding a diode such as a 1N4001 to "goof proof" the polarity. Just one reversely connected battery will instantly send your CMOS IC's to Heaven. C1 is an electrolytic capacitor that will handle any additional broad voltage swings and C2 will help keep stray RF from affecting the CMOS ICs. As a note, C6 in the oscillator should probably be a nicer film-type mica or polyester capacitor or "NPO" type if a ceramic type has to be used as capacitance drift may cause performance issues with the oscillator due to leakage. At higher QRQ speeds this may be more noticeable. Keep the lead length short between R9 and U1a pin 1 so that RF is less likely to be introduced into the oscillator via the NAND gate. Thoughts on Construction: If you are new to working with logic you may wish to first build this circuit on a temporary plug-in prototyping bread board. In fact I would suggest doing that anyways. There are often performance variations in components especially between manufacturers and types and even between different model spec variations of the same CMOS logic. The easiest way to permanently construct this keyer may be use the "dead bug" or Manhattan style on copper clad board. This will provide a lot of RF immunity as well as allowing you to space out the components as comfortable as you wish. I populated my circuit on a through-hole prototyping "perfboard" with very minimal spacing. I have my own preferred method that uses solder blob bridges on the bottom with thin-wire jumpers across the top. Parts are often logically arranged, but I put no thought into where everything goes at first - making it up as I go along. Sometimes it's good to just worry about ground connections all meeting on the solder side first. Just remember to leave some holes for the pin-outs on the ICs. My "housing" solution was to mount the board, batteries and phone-plug connectors in an Altoids� mint tin - the choice of QRP homebrewers! If the final board is no larger than 2” x 2” it will fit. And since I have experience doing this, I advise the rest of you to consider just building the board first and then finding a good container. By far the easiest and cheapest method to construct a useful version of this circuit is on perfboard which is a prototyping PCB with pre-drilled holes spaced in a 0.1" grid space. The underside of the board has isolated copper solder pads around each hole and to connect circuits a generous amount of solder is applied to adjacent pads until the pads overflow and the gaps are basically bridged by solder. I have provided a ready pattern for parts layout on top with routes for solder connections underneath. Download the .jpg or .pdf below for the guide. The traces are color-coded and match the schematic. (Do your own grid counting) Populate the top soldering or tac-soldering a lead or two of each component, carefully checking for placement and polarity. 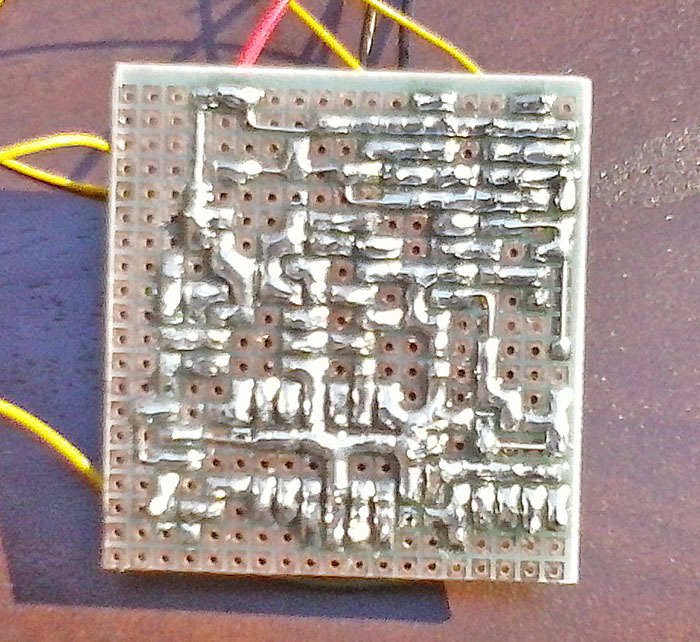 Bridge the paths with solder, but you should use scrap component leads to do most of the distance where able to use less solder. Carefully compare and trace circuit paths while working. Please let me know if there are any wiring discrepancies or other issues. Jumpers; small ridged ones which are made from the discarded excess of component leads as well as insulated wires are used to complete other circuit paths on top. If you are familiar with electronics CAD programs such as LT Spice and Eagle (I've not the expertise yet) then sending off for a small run of custom boards would be better... by the way, if you do, I'd be interested in getting one, particularly if it's in the shape of a mint leaf. Check out this awesome build [shown left] by Wyatt Cornwall, KF7YHB! It's proof to me that at least the circuit works beyond my own prototype. Using a metal container is preferred to combat RF, but that still doesn't mean that RF from an imperfect antenna system isn't going to wreak havoc on your keyer or worse, cause damage to the components. There are other solutions that can be employed such as key-line isolation or grounding and shielding with toroids but this is out of the scope of this lessen, so let’s chalk up RF mitigation to the trials of homebrewing. As you might be able to see in the pic, I layer down a padding of electrical tape on the bottom to keep the board traces from contacting the metal surface. I usually place the nine-volt on one side and the connectors on the other, and in this case I have left space available for a mini-panel-mount potentiometer, which I'll have to special order. For now I have a miniature 1M pot mounted to the board which I have to set with a screwdriver. If it wasn't obvious in the schematics, JP1 - JP22 are header pins. These are usually gold-plated and you'll often find them on your PC's motherboard. They're generally inexpensive from any parts wholesaler and you can either get the 2-pin configurations and build them up for the headers in these circuits requiring more (JP6 and JP10) or buy a few larger ones and cut them down. For the main keyer circuit, if you wish to try the mods later on, install the jumper pins and use the little plastic/metal shunts, like the ones you find in your PC or on the back of hard drives. I don't show a symbol for doing so but they must be shorted (closed) for normal operation. When you add a mod, you would remove the shunt jumpers and add in your circuit. For the separate mod circuits or any nifty switch or additional logic control circuit connected to a jumper (JP10) you can use those jumpers with the wires attached like you see in your PC case, usually connecting the reset button, headphone jack and all that. In fact, that is probably the easiest way to get a hold of some. If you plan not to use any mods then omit the JP components from your build and wire straight through. For the Mode Select jumpers JP6, you wish to use only one mode such as "Mode B," omit JP6 and wire U2 pins: 1 and 12 to Vcc (+V). And, if you're not using Mode A you can also omit diodes: D5 and 6. Other things to mention: The power consumption on this keyer is LOW! No, really! When in use, the keyer will only draw 0.5 miliamps, and when not in use does not even register on my multimeter! Using MOSFETS on the output helps since they are voltage-controlled devices and the CMOS ICs, according to their specs, only draws a mere 50 nanowatts each. If you were supplying LED’s the current would jump drastically but so I suggest not anything else fancy to it and if you're using a nine-volt battery, use a "heavy duty" type meant for low-drain devices. You should not have to install a power switch and it should last a year for sure. An Alkaline battery will probably leak if left in with that little of current being drained. When handling the components, take necessary precautions as the CMOS ICs and MOSFETs are extremely sensitive to static discharge and reverse polarity. Always room for improvement: A predecessor of this keyer has been coined "A Simple Keyer" because of its Spartan operation. It lacked basic features taken for granted on modern versions internal to modern rigs such as Dot/Dash Memory which allows for leeway from human error by making the timing of your finger movements less critical to keyer operation, and it lacked "weighting" (the relative timing between an element's mark and space) which is important to many hams dealing with older rigs as well as the increased need for more staccatic elements is crucial to faster sending speed. Yet, the original circuit core used three ICs as well! The simpler "Simple Keyer" iteration of this keyer's core design uses only two ICs - It's elegant, but you get what you pay for. Most hams have trouble sending in basic iambic mode. There are countless keyer circuits devised over the years that employ memory for canned macros and allow for the adjustment of each elements as well as weighting and some of these circuits use way more logic than is required to do the job. But with all that said, Amateur Radio homebrewing is all about improvising and innovation. Each ham is free to do what they desire in the name of fun and education. As this is a simple circuit, there isn't much more I could do to it and it works great for most application. Added niceties like control for element weight scaling (mark/space ratio) and a couple of other modes such as "Ultimatic," "Bug," as well as "boat anchor" high voltage keying have been offered [BELOW] as alternative add-on mods. So there are 1-chip keyers out there to be had for a few bucks, why not just use one of those in your QRP rig? That's obvious to many hams! If you're going to homebrew your own QRP rig or build one from a kit, then why not homebrew your own accessories. 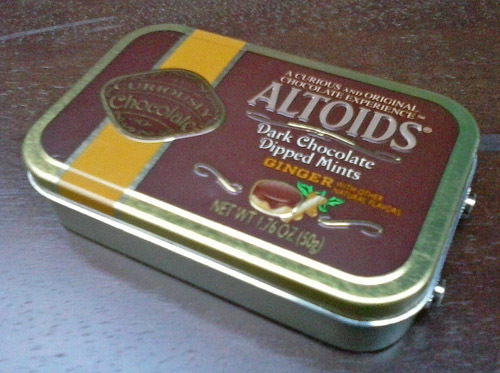 How many hams can say that they built a functional iambic keyer from off-the-shelf components that just so happens to fit in an Altoids� mint tin? BOOM! 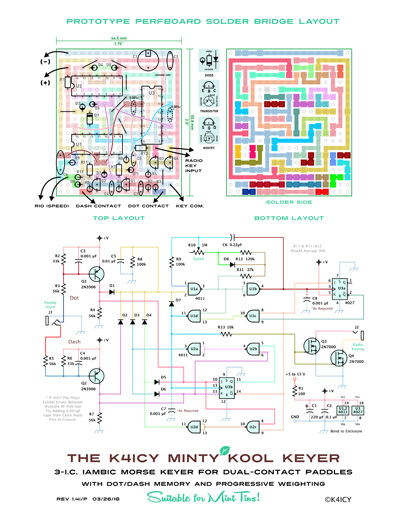 A Minty "Kool" Keyer. It's been a 'work in progress' and I still have testing to do on different rigs, but at least I know I don't have to rely on one ordered online existing only as a program on some mystery chip. Check out Mike Penzo, WM4X's build! - Nicely integrated inside of Century22 Transceiver. Weight Control with the Mints Diet - Adding Element Weighting to the K4ICY Minty "Kool" Keyer for Improved QRQ. Weighting is the relationship in time-duration (or ratio) between a single Morse ‘dit’ element (called a “bit” or a “mark”) and its associated silence (called a “space”) following the element. This attribute can affect not only the way the code sounds but the ease at which it can be copied, as well as its performance as sent via transmitter. Well-sent code is said to have 1:1 weighting where each ‘dit’ is equal to 1 bit, each inter-element space is equal to 1 bit as well, a ‘dah’ holds out for three bits with three bits for inter-letter spacing and seven bits between words. The word “PARIS” is said to contain 50 bits and represents an “average” English word. The universally accepted perceived Words Per Minute (WPM) value takes into consideration how many times PARIS can be keyed within one minute. 1:1 code sounds proper at slow speeds but ramp up the pace, to say, over 40 WPM and (most) human ears begin to have trouble deciphering code. It would then not be surprising to know that many seasoned CW ops prefer a “light” code weight where the marks are shorter than the spaces yielding a staccato quality to the sound, making fast code actually easier to copy. To learn more about code weighting, check out this YouTube video: https://www.youtube.com/watch?v=oidlVnChVAQ Take note that ‘light’-weighted slow-code doesn’t sound particularly very well to most ears – a reprieve to a limitation we’ll discuss later. An issue that also arises with faster code has to do with the way that a transmitter sends the code itself. If you cut a CW transmitter on and off instantly according to when your key contacts close and open, you would most likely be producing a lot of clipped and hard-terminated waves, and as any of you higher-class hams should know; a radio frequency wave that isn't perfectly formed is actually a mash of many wave frequencies or wave shapes, with many that are essentially square waves. Square waves contain harmonics of course and a CW transmission sent in this manner would splatter all up and down the band, producing clicks and pops too. To avoid this, your transmitter eases the CW signal up and down in power-amplitude making sure that only pure sine waves are produced completely. So this ‘envelope’ shape encapsulating the CW signal has pre-determined rise and decay ramps taking a certain amount of time to complete. As the sender’s code speed increases, the decay time may reach and surpass the amount of (space) time left in between elements until ultimately, the code becomes muddled or the signal sends continuously. Shortening the code element (mark) time gives more leeway to the CW envelope so that distinguishable code can be still sent. http://k4tlh.net/wp-content/uploads/2014/12/TARS_Newsletter_2013_May.pdf Below, you can see how I implemented the counter idea in the "Mint Deluxe" model. 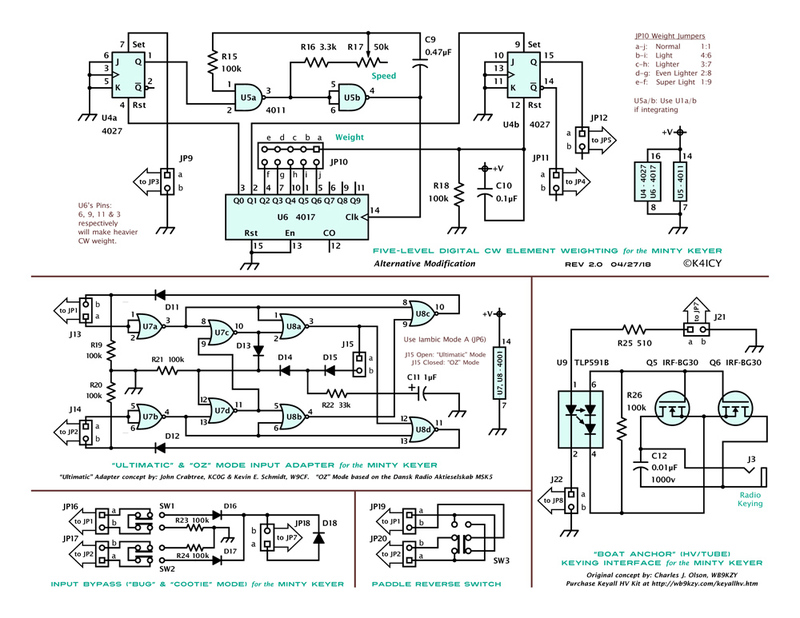 Referring to the [above] schematic, take note of the logic oscillator circuit (center-top) comprised of (4011) U1a, U1b, D8, R9-12 and C6; you can see that this section has been revised from the schematic in my original article. This is a basic NAND gate ("rectangular") logic oscillator circuit where a bi-polarity capacitor is charged via resistor(s) in an RC circuit which upon charging and discharging at a rate determined by the values of R and C cause the gates to flip high/low states generating a square wave. If the time-constant resistor(s) was one value (as arranged in the original circuit) the timing at U1’s pin 3 (and inverted at pin 4) should yield equal timing of both mark and space across the full timing range determined by R10. A PWM scheme is used in this schematic to present two separate timings, one for charge and the other for discharge. Routing diode D8 presents the bypass or introduction of added resistance depending on the flow of current to or from capacitor (C6) to charge at a rate determined by one resistance value and then discharging at another. Notice the values of R11 (27k) compared to R11 (27k) + R12 (120k) [= 147k] as they form a representative ratio. R11 determines the shorter mark timing in this circuit and R11 + R12 governs the space. The average between R11 and R11 + R12 should be in the ball park of 90k and any non-typical values can be obtained of course by adding series or parallel components to reach equivalency. Here, I’ve slanted the tendency for “light” weighting as R10 is decreased (proportional to timing.). R10, as before, gives you a dynamic code speed range between 6 and 60 WPM taking R11 and R12 into consideration. Essentially, the whole network of resistors represents a combined set of resistance for generating a complete PWM mark+space timing cycle. Now if you’re building this keyer, you could easily plug in your own resistance values or even a resistor network configuration to get a good weighting ratio at the larger 1 M-ohms area. To figure the charge+discharge times for yourself (And you Extras should know this,) what we need to know are the the times of both mark and space in milliseconds. We can derive component values and WPM speed with this knowledge. You Extras should know this by heart, (sure) but multiply the Capacitance times the Resistance: (you must consider decimal places of course because they will kill ya) Capacitance in μF x Resistance in Kilo-Ohms = Time in milliseconds, And that's the length of time for either the mark or the space. Multiply by 0.001 to convert the result to Seconds. To find the “universally accepted” WPM, add your charge and discharge (mark and space) times together and divide by two (for an average,) then divide that into 1.2 for your WPM speed. The "1.2" has something to do with the 50 element bits in the word “PARIS,” as in milliseconds, figured into a minute. For example: if we find 1 M-ohms (1,000k) for our resistance (averaged for both directions) and find the total charge/discharge time for the 0.22 μF cap we get 220 msec. (1,000 x 0.22 x 0.001 = 0.22 seconds) for a combined mark and space ‘dit’ element cycle. To find for the speed: (1.2 � 0.22 seconds = 5.4 WPM.) You can also multiply your desired WPM speed by 50 and divide that into 60 (seconds) to derive the millisecond length of the combined mark and space elements. In The Real World... After doing the math (as Mike showed you) and pawing for an hour through your resistors bin, you plug them in to find that your top speed is around 45 WPM and the timing is way off. In some kind of balanced transistorized oscillator these values would be adequate, but there are two pesky factors to consider; the logic-gate thresholds and the voltage drop of the routing diode D8. The drop has more affect on the threshold than the capacitor timing curve. It may be best to experiment with two potentiometers first and match your results with fixed resistors. There's also an inherent issue with the tuning of the entire speed range. 5 WPM to most, no doubt, sounds very slow, and 10 WPM may sound slow as well - but it's twice as fast - and yet you have to move the dial to the halfway point for that. At 20 WPM you've moved the dial up to the last quarter and as you reach for some control over faster speeds you'll find that it takes a surgeon's hands to home into something comfortable. You should try to at least use a reverse-log taper potentiometer. Or you could series in an additional 100K pot for fine-tuning. Once you build your Minty Keyer you may notice that the lighter weighting only happens at the highest of speeds. You're correct. You'll find that the WPM has to be up around 30 or 40 for any effect to be noticed. This pseudo-fix wasn't meant so much for your ears but for the rig you run with this. As mentioned, I offer a more concrete digital solution below as an add-on, but for simplicity's sake, every little thing helps. Here’s the catch! When the keyer is generating code at the insane speed of 60 WPM, R10 would be set to zero Ohms and C6 only has to charge and discharge through R11 and R12. The difference in charge time is drastic between these two paths at such low resistance at R10, potentially a 5:1 ratio! You can really get some super-light weighting with that. But, at the slow end of the scale with R10 turned to a max of 1 mega-Ohms, R11 and R12 appear to be virtually insignificant! In fact, you get only a resistance ratio of nearly 1.1:1, so no discernible weighting there for sure. Any good marketing person will make lemonade from lemons simply by adding a positive descriptor – I chose “progressive!” This is a case where an inadequacy turned out to be an okay thing because we really only need the lighter weighting at the higher speeds and not at the slower speeds. With my (chosen) fixed values together I get a good 4:1 mark/space ratio at 60 WPM, 2:1 at 45 WPM and 1.5:1 at 30 WPM. I derived these values ultimately but tweaking a few temporary pots while keying up a (non-shaped) audio oscillator into my PC and used SoundForge to analyze the timing. Your results will certainly vary, especially when you take C6's real-world tolerance into account, the thresholds of the gate inputs and the voltage drop on the diode will also affect the results. So the K4ICY Minty Keyer is good enough for prime time (but not perfect!) I was able to make the changes to my mint tin build and confirmed my results with a program called SoundForge on my PC. Audio was sampled via Yaesu FT-857d (into laptop) reading ultra-low-level RF leaked from my Kenwood TS-130SE fed into a 50 Ohm dummy load at a very low wattage. I was able to analyze the waveforms and measure the millisecond timing of code produced through the keyer’s available speed-adjustment range. The standard niceties of a keyer are there, minus canned messages: adjustable ‘iambic’ ‘squeeze’-keying, dot and dash memories, progressive weighting to allow for cleaner copy and sharper sending, especially on older rigs at faster speeds, and lastly, rig control for most solid-state transceivers. Soldier: "It's not a question of where he grips it! It's a simple question of weight ratios! A five ounce bird could not carry a one pound coconut." The Minty Keyer is perfect for the QRP enthusiast who dabbles in hombrewing. This is due to its small size, being able to fit in a mint tin, ultra-low power consumption and crisp sound and actuation for high-speed users, and there's no real need to improve upon it for that application. Many homebrewers happen to be proud owners of 'boat anchors', or older transceivers using tubes and transistors. These are often amplified which means a good chance for some RF interference with the keyer, either from the keyer, or worse, uncontrolled RF radiation working through the key itself. Larger wattage antenna systems are trickier for this. Older rigs also have slower rise and decay times on their CW signals (CW shaping envelope) which means that normally weighted code elements tend to sound more muddled, or worse, at QRQ they may actually run together. Keying is even more complicated by the odd power/switching requirements of these rigs. I set out to address a few of these issues and a couple of other goodies and I offer them as mods which can be added any time after you build the Minty Keyer's main board. NOTICE ::: The "HV/Tube" Keying Interface may contain potentially lethal voltages and current in operation that may pass from your keying line if you're using a tube-type rig and safety should be the highest priority when experimenting. Mike Maynard, K4ICY holds no liability! Any suggestions, error troubleshooting and corrections will be gladly accepted. You will notice the addition of U4 and U6 on the (mods) schematic above. U5 can substiture U1 for single-board integration. U6 is a 4017 decade counter and U4 is a pair of J/K flip flops that are configured as Set/Reset Latches. The logic ("rectangular") oscillator has been detached from the original circuit (via jumpers) and sped up by a factor of 10 for use in the weight ratio creating process. The oscillator now serves to run the decade counter through its paces. The output of the diode/resistor OR gate network - or the signal that paddles have been squeezed ("keying line") - now signals pin 7 of U4a. The U4a J/K flip flop is a simple S/R latch that waits for the keying line at pin 7 to go high where it causes Q at pin 1 to go high which activates the oscillator at pin 2 of U5a. As long as pin 7 of U4a remains high, so shall Q at pin 1 which keeps the oscillator running, producing element sections until you stop with the key stroke. Once the key contact is broken and pin 7 (Set) goes low, Q at pin 1 should remain latched at high until a signal is presented at pin 4 (Reset). The 4017's clock is fed directly from the oscillator. It should start at Q0 (pin 3). and as the clock receives transitions from low to high, each subsequent pin, Q1 through Q9 should take their individual turn with a high output. Once the counter rolls over, Q0 at pin 3 will go high again sending a signal to U4a's Reset at pin 4. Not-Q at pin 2 will go high but if the key line is still high at pin 7 (Set) then nothing will happen and the 4017 will run its course again. If Set is low then Q will go low when Not-Q goes high and the oscillator will stop. U4b is another S/R latch whose job it is to act in the place of the oscillator (alternating high logic pulses and inverted pulses) originally used in the main Minty Keyer circuit. I could have also used two sets of NAND gates but the logic here would have required inverter buffers on the R and S inputs so it was a better option to use a single dedicated 4027 IC. That's about it... the 4017 and the other gates act as a way of dividing up the Mark and Space elements, but in a controlled way. Q1 at pin 2 of U5 4017 causes U4b to make Q at pin 15 go high which flips the cycle into the keyer just as the old standalone oscillator did. U6's Q1 (pin 2) immediately signals once you apply a stroke at one of the key paddles. Q2 through Q9 and even Q0 (which actually signifies 90% in the count cycle, are used to tell U4b when to flip the cycle from Mark to Space. The entire count cycle of the 4017 represents the combined Mark and Space cycle. Please note dual-in-line header JP10 (you can also use a 5-position rotary switch.) You get five settings: on one side the Mark and Space get 5 steps each and represents a 1:1 element weight timing. On the other end you only get 1/10th of a Mark relationship and is most likely too light for any rig as it does take a little time to build up a CW signal envelope. Choose anywhere in between to suit your ears and rig timing for the most intelligibility of your CW signal. You do not have to use the 5-pos rotary switch. You can wire pin 12 of U4b directly to your chosen timing spot and make the weighting permanent. You can also just use a two or three position switch to pick your own selection. Q6 (Pin 5) of the 4017 is where you will get a 1:1 weighting, at any output step above that (Q7 - Q9, and Q0) you will get "heavy" weighting where the Mark is longer than the Space which will not be very useful in CW telegraphy... unless you so desire. This part of the circuit has uses outside of the keyer and can give you a way to produce a Pulse Width Modulation (PWM) signal at any given frequency (up to the response of the 4017 counter). This may be useful for other circuits, like audio creation and LED dimming. You'll only have 8 steps of gradation (10 including on and off) to choose from. You can extend the resolution by daisy-chaining more 4017's, using their Clock Enable and Carry Out pins to give you more division outputs and multiplying the speed of the oscillator in relation to the added counter banks, but that is beyond the scope of this project. We've now increased the oscillator speed by a factor of 10 which means that the discrete components were changed. R16, the potentiometer was reduced to 50k ohms, which is a more common part and C9, the tank capacitor was increased as well. We've added two more IC's as well and now we have perfect and proportionate CW weighting control over and entire range of code speed from 4.5 to 65 WPM using a 0.47 μF cap for C9 or 5 to 70 WPM with two paralleled 0.22 μF caps (which considering tolerance most likely would give you a value of 0.43 μF. This is great, but lighter weighting is really more useful for old-timey rigs rather than modern QRP'rs. 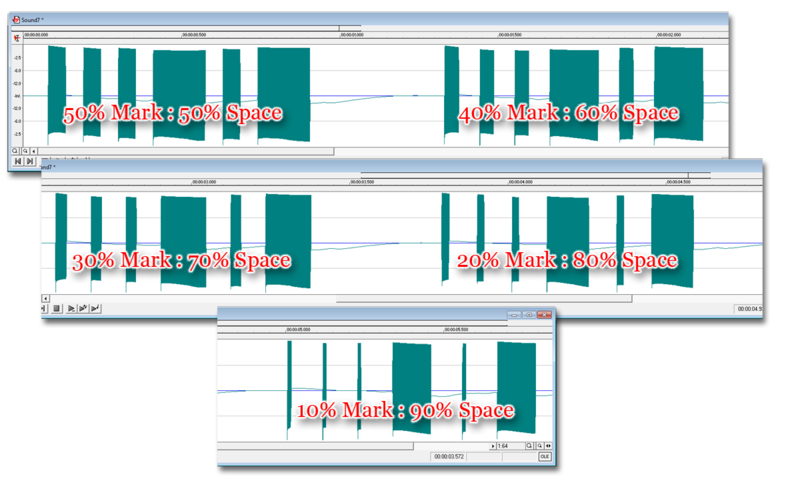 I personally prefer my sending to be at 40% mark : 60% space which sounds a little snappier like my J-36 Bunnell 'bug'. Below, you can see the results of the test circuit; Most of the Minty Keyer mod circuits were cobbled together on a solderless prototyping board, minus the rig control switching and a simple Twin-T CPO oscillator with LM386 amplifier IC was used to provide audio to feed into my PC where was able to take timing measurements. You can also go 'heavier' in CW weight but it really sounds muddled. Considering useful lighter CW weighting, we need the ability to actually key the big guns and rigs with odd tube designs. Yes, I admit I "borrowed" this rig controller circuit [lower right] but we needed to key practically all rigs and this was a great solution. Q5 and Q6 are TO-220 packages which are IRF-BG30 MOSFET's. They have an operating Drain-to-Gate voltage of up to 2,500 volts at 4 amps. The reverse max is at 2 amps so that is our range. Under the the host rig's own power, once activated by U9 a TLP591B Photo-Voltaic Device, you can key up nearly any type of rig including negative voltage ones (grid block keying,) positive voltage rigs (cathode keyed tube transmitters) and of course, conventional 13.8V powered solid-state rigs. You can substitute the MOSFET's for any that suit your requirements and the Opto-isolator can be substituted as long as the operating parameters are sufficient for your rig. If and AC signal is used you should consider the real Vrms power value. This part is the means to completely separating the keyer and your key from the rig's power and any RF issues usually resulting from shared (bonded) ground or signal line connections. You can ground the keyer if you must, but you might want to keep the MOSFET outputs isolated from the keyer. CMOS IC's are extremely sensitive to RF and power source fluctuations. If your rig is not a beast, simply use the configuration in the first keyer using the 1N7000's. PLEASE NOTE RESISTORS R25 and R26: R25 at 510 ohms was calculated to restrict current to U9's LED at a keyer supplied voltage of 9 volts. Some calculation should be considered in using the right resistor for your supply voltage. R26 at 100k ohms should fine as a current shunt but you may need alter the resistance if the rig keys on constantly or doesn't at all. All wiring in the rig keying circuit should be of a gauge and physical spacing suitable for high-voltage operation. BEWARE OF HIGH VOLTAGE!!! The keying voltages present in this circuit, when used on some rigs can kill you! 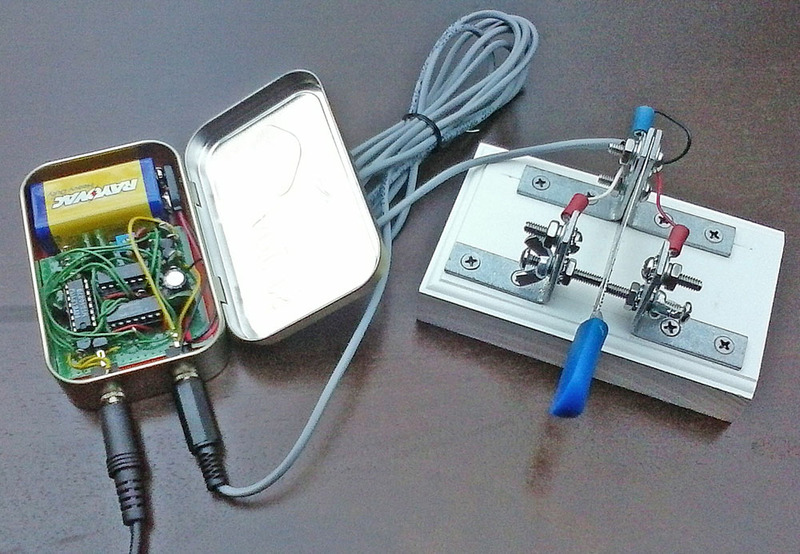 The original concept and circuit for this, called the "Keyall HV kit" can be ordered at: http://wb9kzy.com/keyallhv.htm . To simplify matters, it will most likely be a better deal to just order the kit. There are also instructions and a formula for determining the LED resistor. YES, you can run the HV interface and the native one shown in the main circuit simultaneously (in parallel) so that pretty much any rig can be run. The two aforementioned upgrades are major improvements to help you get your old "boat anchor" running with your homebrew Minty Keyer, but that's not all! One the middle-left is an adapter circuit using two 4001 Quad-NOR Gates (U7 and U8.) I borrowed this idea from Kevin E. Schmidt, W9CF which was redesigned by John Crabtree, KC0G. You simply plug J13 and J14 (female) onto J1 and J2, apply power to the 4001 IC's from the main circuit and the paddle inputs will be restricted to operation that mimics the old "Ultimatic" keyer, the original keyer circuit. Go to http://fermi.la.asu.edu/w9cf/ for more information or directly download the PDF: http://fermi.la.asu.edu/w9cf/articles/ultimatic.pdf . You can learn more about modes like "Ultimatic" in Karl Fischer, DJ5IL's article: http://cq-cq.eu/DJ5IL_rt007.pdf . My adapter also comes with a sub-mode, and all you have to do is shunt header J15! Coined "OZ" Mode by the author, a Danish company "Dansk Radio Aktieselskab" in the 1970's, manufactured its brand of squeeze-keyer called the MSK5. It became very popular in that country and operated in something like "Ultimatic" mode except for their touted feature which was intended to further increase sending efficiency by basically inserting a single dit if the dash paddle was first pressed and then the dit paddle was pressed in succession. After the one dit was formed the keyer would revert back to sending only dashes. Please read the article for a better explanation and you can also read the original instruction manual for the MSK5 here: http://www.skovholm.com/SK2.pdf . You will also find instructions on how to operate "OZ" mode, which after some practice is actually quite pleasant to use. See the NM7T OZ MODE ADAPTER Click Here! I've also added two mini treats that should be useful to some. One is a set of switches that will bypass one or both paddles for semi-automatic operation like a "bug" or "Cootie" (sideswiper.) This is interesting and all but the keyer in 'bypass' will at the least act as an electronic/RF buffer, perfect for running bigger, older rigs with you commercial message memory keyer or keyboard, or at the least, a great de-bouncer for an old scratchy key. I've also added a swap-switch just in case a friend brings his favorite paddle and it's wired differently. You can also use two crossed jumper wires between J1 and J2 to make things simple. Other goodies can be added according to your imagination. I would like to implement a Flash-based MACRO memory keying bank which would be separately adjunct to the keyer. Why seek to improve an obsolete design with half-a-century-old technology when so many simpler and novel methods exist today? Nearly all modern rigs come with on-board CW keying and what modern ham wouldn’t rather dabble in the newest microprocessor or microcomputer? 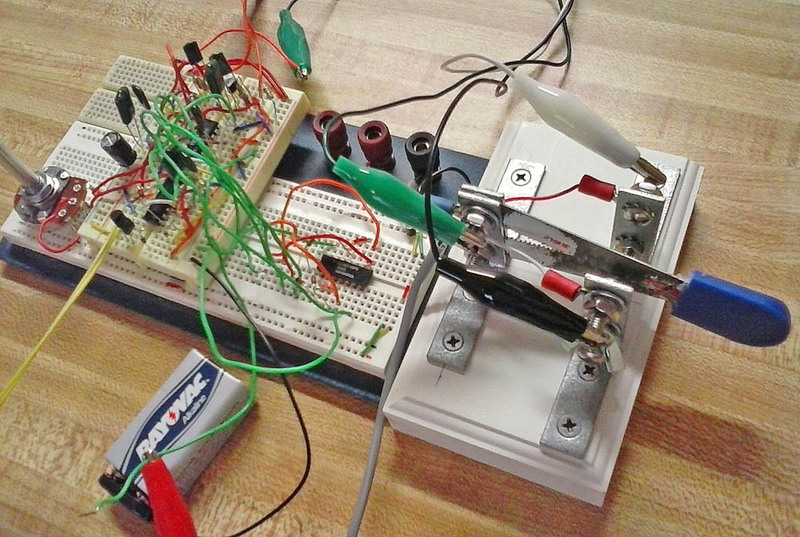 Sure, you should try everything once, so build an Arduino keyer too sometime in your ham career – check this out: http://blog.radioartisan.com/arduino-cw-keyer/ but be prepared to learn some programming. Well, even the single-IC Curtis chip existed in 1969 (http://namham.phpbb8.de/general-topics-f18/history-the-curtis-keyer-t50.html) with the EK-39 but the reason for “rolling your own” was the same then as it is now: the draw to building a piece of equipment from more fundamental parts boils down to the homebrewer’s sense of ‘roughing it’ – bringing a wonder to life with your bare hands – especially a device you understand the inner-workings of. Now, more than ever, there is a modern movement amongst hams in homebrewing or kit-building their own gear, especially gear you can take on the trail. 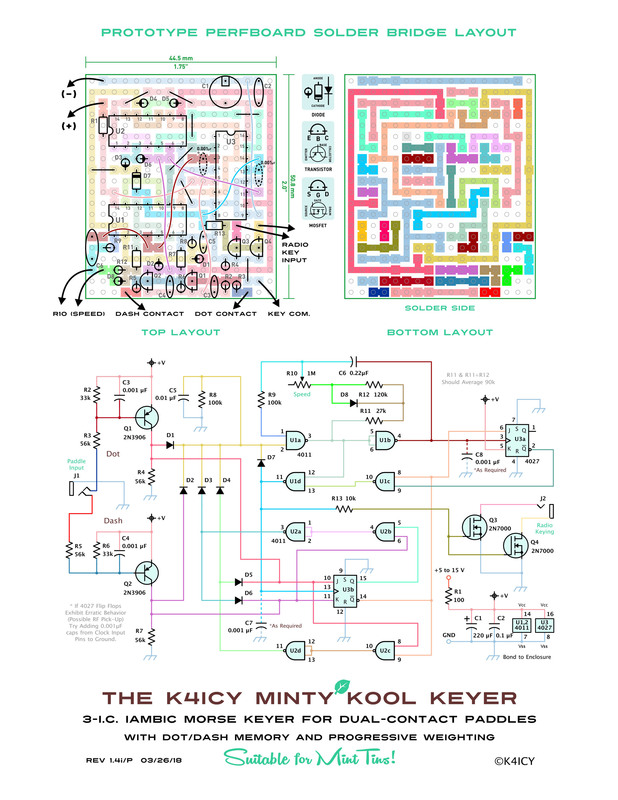 I cannot take complete credit for The K4ICY Minty Keyer. The keyer’s genesis was conceived by Richard P. Halverson, W0ZHN, and Ronald A. Stordahl, K0UXQ, for their article “An Integrated-Circuit Electronic Keyer,” [pg. 22, QST, April, 1968]. It was also a 3-IC circuit and had dot/dash generation using a single-lever paddle, but no iambic (“squeeze”) keying. 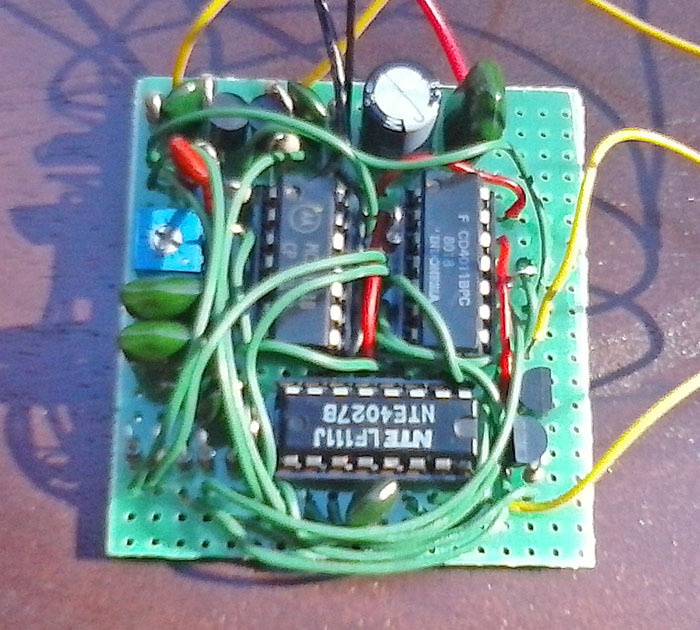 Urs Hadorn, HB9ABO of Oberglatt, Switzerland modified the keyer for his article “Simple CMOS Keyer,” [pg. 70, Ham Radio Magazine, January 1979.] 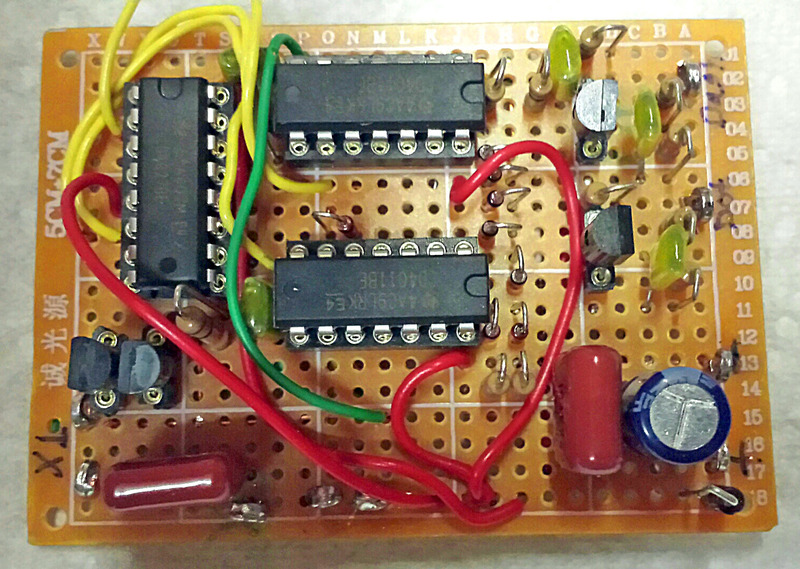 His circuit was just about the same as the one presented in the QST article but with only slight improvement, however he reduced the chip count to two, provided several rig-interfacing schemes and actually built a few keys to go with it. Three years later, Oh Hoekstra, PA2OHH, from the Netherlands made his first “Simple Iambic Keyer” circuit and in 1999 posted a revised model online at: http://www.qsl.net/pa2ohh/iambic.htm. Not only did he revise the HB9ABO circuit, adding iambic dot/dash coordination which allowed for use of a dual-lever paddle, but improved the key and rig interfacing. Even with his offer, there were still some features missing that all the builders mentioned here made note of; features that proficient CW operators often desire for comfortable sending: dot/dash memory and weighting. Dot/Dash memory allows for extra opposite elements to be generated upon command even if the keyer was busy; so if you are in the middle of making a dash, tapping on the dot paddle would put a dot in queue to be made once the dash was completed. This makes for sure and comfortable ‘squeeze’-keying. Weighting was the obvious additional creature comfort. One search on Google for "keyer circuits" will show you that many folks have come up with many solutions (some simple, some not) to a seemingly small niche within a niche or the Amateur Radio hobby. There was a day when analog rigs based on tubes and later transistors required either the skilled manual 'fist' of the operator to transmit intelligence or a mechanical and ultimately an electronic solution. Modern rigs have this feature built in, but hams like to keep the old 'boat anchors' running and many modern QRP and kit-based rigs which have been quite popular as of late still require keying for those who won't be using straight keys or sideswipers. It's interesting to analyze the circuit strategy of each keyer design offered. This writeup by Gary, ZL1AN, in Auckland, New Zealand, http://www.qsl.net/zl1an/Circuits/circuits.html shows an interesting chronology, one design in particular; the ever so popular ACCUKeyer (73 Magazine, August 1975, pg. 58) of its time is an example of design using perhaps way too many parts for what it did (http://www.survivorlibrary.com/library/73_magazine_1975_08_august.pdf#page=60). It's easy to pick apart one design, comparing it to the virtues of another, such as declaring that an 8-pin SMD PIC microprocessor is 'better', but really that would be unfair to say and un-ham-like at that. Any circuit solution, is a solution. If it works then the builder has at least succeeded in their goal. Any ham who can truly call themselves a "ham" has at least attempted to build their own equipment and can show that they truly understand at least some aspect of what goes on "under the hood." More than just an "appliance" operate, a ham that has built is closer to being a "complete" ham. Take it from Frank Harris, K0IYE... NO REALLY, you can take his wisdom for FREE on the homebrewing spirit of our hobby, just visit http://www.qsl.net/k0iye/ to read his book. If you so choose, I hope you enjoy building the Minty-Kool Keyer as much as I have. It certainly performs well enough. Feel free to ask me questions or submit comments.